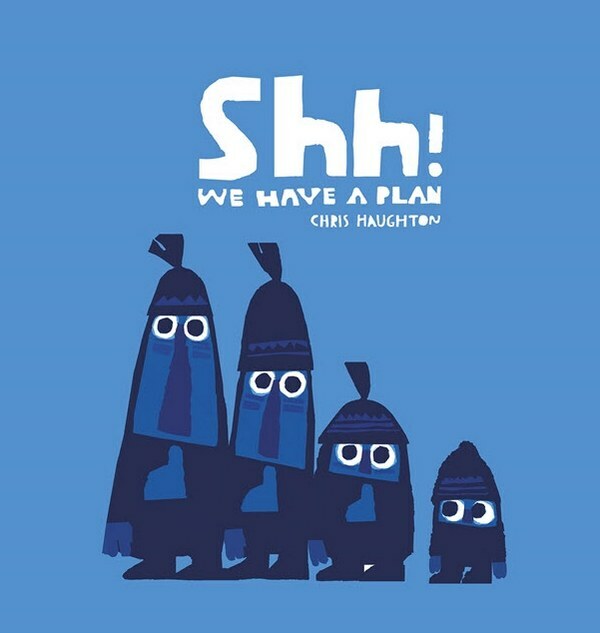 I was thrilled when I discovered Chris Haughton’s first book, A Bit Lost. It was (and still is) the perfect blend of drama and laughs. Haughton’s illustrations also stood out from the bunch – original, expressive and with a restricted use of colour that is exceptionally clever. The latest from Haughton is Shh! We Have a Plan. Four friends, three big and one little, are out for a walk. They spot a beautiful, colourful bird perched in a tree. They simply must have it! Nets poised, the group stealthily approach the bird, but their efforts repeatedly fail. Meanwhile, the littlest of the group knows that a bit of friendliness can go a lot further than any elaborate plan. Can he lure the bird closer? Once again, Haughton’s illustrations are marvellously expressive. The purple and blue colour palette create the perfect ‘deep in the woods’ atmosphere and the dark, geometric shapes used for the characters contrast brilliantly with the beautiful bird and the limited white space. The story is chock-full with the sort of suspense that appeals to pre-schoolers – each attempt to capture the bird is introduced with “Ready one… Ready two… Ready three…”, creating delicious tension for little kids. Shh! We Have a Plan is suitable for children aged two years and up. Find it at Book Depository (while you’re there, pick up A Bit Lost and Haughton’s second book, Oh No, George! ).